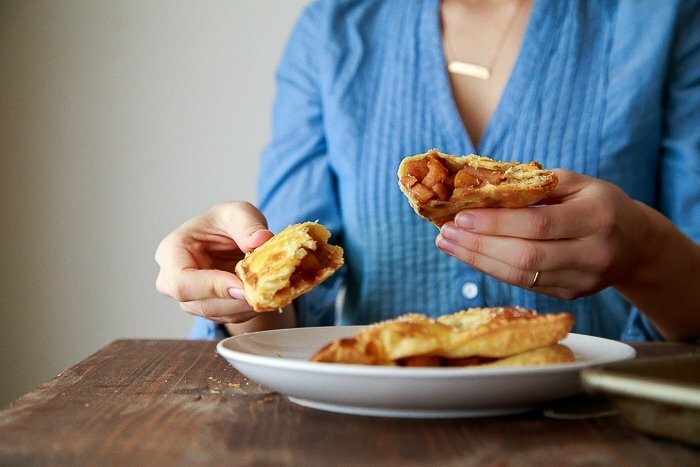 Apple turnover recipe made with one sheet puff pastry, apples, brown sugar, and spices. Now that you are armed with a 15-minute puff pastry recipe, you are considered dangerous. You are capable of whipping up an apple turnover recipe, flaky appetizers with ham and cheese, and French pastries at any time of day. Please, use this information carefully and to your advantage during the whole holiday season. 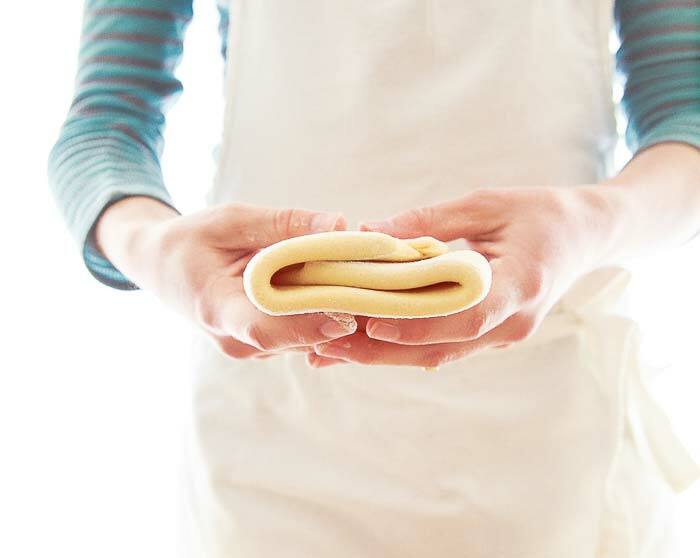 If you’re still afraid of dough, this is the one dough you shouldn’t fear! It only requires 3 ingredients plus a little rolling, and you’re done 15 minutes later. The best 15 minutes you’ll spend this morning is making this dough. I can barely talk about the flaky layers. Oh, the flaky layers. And the buttery scent while it bakes? My tongue was almost on the floor. I was laying next to the oven getting high off the scent. Ok, too much information. I tweaked the apple filling recipe from my apple-stuffed baked apples and use it in these turnovers. It did not disappoint. In fact, these turnovers were the highlight of my morning all week. So, let’s review. Make this easy dough: recipe here. Saute some apples. Roll the dough out into a perfect square. Pile the apples into each of the four corners of the dough. Trim, fold over, and crimp the edges closed. Bake until your kitchen smells like Heaven (20 minutes to Heaven). I love that this apple turnover recipe makes just 4 turnovers. They freeze very well, both pre-bake and post-bake, so you can always keep them on hand. I love using them as a fun breakfast treat on the weekends. 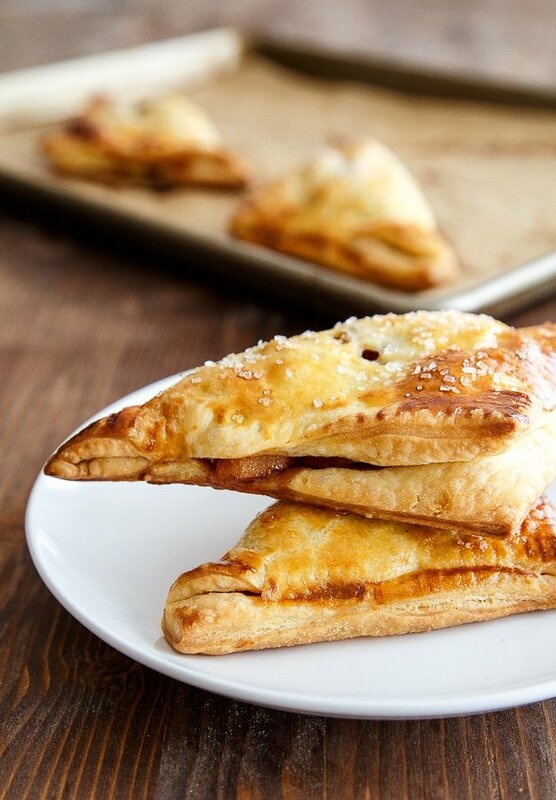 Don’t let apple turnovers cool. Eat them right away. Your fingertips will recover from the burns, trust me. Puff pastry is superior to pie dough when making turnovers, in my not-so-humble opinion. Dice the apple small, but not too finely. See the photo above for reference. A beaten egg yolk brushed on top will help make these apple turnovers look like they’re from a bakery. Turbinado corase sugar helps, too, but is totally optional. Preheat the oven to 400-degrees F, and line a large baking sheet with parchment paper. First, peel and core the apples and dice them. You should have 2 cups of diced apples. A little less is fine. Add the apples, cinnamon, lemon juice, sugar, butter and salt to a sautÃ© pan, and cook over medium heat until the apples soften and caramelize, about 7 minutes. Stir frequently. Remove the apples from the heat and let cool. Meanwhile, roll out the dough into a 12-inch square. Use flour as you go to prevent sticking. Divide the apple mixture into 4 piles in the corners of the dough, but leave about 3/4" of border. Cut the dough into four equal squares. Fold the edges of the dough over each of the apple piles. You will have 4 triangular pies. Crimp the edges closed with your fingers and the tines of a fork. Carefully move the pies to the baking sheet. Brush each pie generously with the beaten egg yolk. Sprinkle with coarse sugar, if using. Bake the pies for 20 minutes, or until golden brown and puffy. Serve immediately. Hi, this is going to make my marriage last forever. Thank you counselor. That sugar on top is my fav part. Def not optional! Excited to get back in the kitchen and knock these out using that easy peasy dough recipe. Yeah well this is PERFECT! You just saved me the anxiety of making dough. Something I steer clear of. But now I don’t have to and I can savor all those apples sitting on my counter…. I’m going to gain an extra layer just because of these this winter. And it’s all your fault. ooooh this is incredible. A miracle cure for the Mondays! I’m wishing I had read this before making breakfast! Holy moly this looks delicious! I’ve been in the mood to bake up something yeasty, but that desire may have to take a back seat to these beauties. Great work! Any excuse to make your quick puff pastry, and I’m there! These look killer! oh yummy! I love apple turnovers and you’ve made them look so easy (and delicious)! can’t wait to make these!!! and the 15-minute puff pastry! SOLD. On all of it. Making and eating ASAP! Can I kiss you? I love love love love making these little things and eat it just after baking. I’m too lazy to make the dough anyway… always bought ready made. Will give a try one day… cold day like this a bit exercise is good right? Thanks!!! Absolutely gorgeous. Making puff pastry is a pain in the you know what, so I appreciate this recipe. Omg. I have made 6 batches this week. Incroyabil! And ididnt use the fancy butter either – think whats going to happen when i lay my hands on that!!!!! this looks fantastic! I’m very excited to make this, although I did have a question about refrigerating it. Is it something that I would be able to do or would it ruin the tastiness? I was thinking I could make some tonight and leave them in the fridge for my husband to heat up for his breakfast. Hi Lindsi-they will be softer if you refrigerate them. Try reheating in the oven, not the microwave to crisp them back up. I didn’t test the recipe this way, so I can’t guarantee the results, but I wish you the best of luck! I have been making apple turnovers for about 6 months at least once a week me and my family love them, but I’ve always paid $5+ for puff pasty. Nope thanks to use I can save $ and it tastes so much better I think they use shortning in the store bought. Thank you for a great recipe that will be used in our family for a long time. I made these today (along with your brioche buns). Also made your puff pastry for these. They were amazing! Even my husband, who doesn’t like apple-y things, ate it up! I was too impatient waiting for the apples to cook down, and we tend to like the pie goo, so I added cornstarch after it cooled before I made the pockets. Lovely! I made this today and they are perfect! 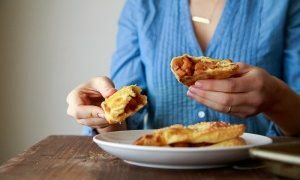 I used your 15-minute puff pastry recipe and it was so flaky and crispy! One tip for those who make these though: Remember to thaw the pastry before using! Thank you so much for this wonderful recipe!